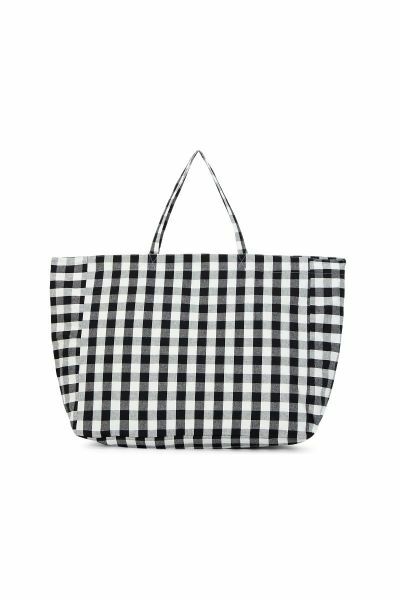 This chic black and white cotton check bag is generous in size with double handles long enough to hold, or wear on your shoulder. Made from lovely soft canvas with an internal pocket to keep your valuables safe. The Paris bag in black & White checked canvas is a large tote bag that will will fit anything from your books to the kitchen sink. Two short handles fit perfectly on your shoulder. There is a handy inner pocket made from the check, the exact size for your phone. Paris has been fully lined in cotton lining. The Paris Bag is made from a black & white checked crisp cotton canvas which is woven in Portugal. Paris was made in Hampshire. Caring for your Bag: Paris can be machine washed at 30°, we recommend using Ecover non-biological detergent as mother nature prefers it. Can be dry cleaned if you must, with an ecologically friendly dry cleaner. Can be pressed with a warm iron, due to the nature of canvas it will need a good press after washing. Please do not bleach or tumble dry Paris.